Popular in spas and wellness centers across the world, ionic foot baths harness the detoxification power of negative ions and salt water to rid your body of unwanted toxins. An Ionic foot bath works by introducing a low current of positive and negative ions into salt water to attract and draw out impurities and toxins out of the feet. Toxins have either a positive or negative charge, and are attracted and drawn out of the body and neutralized by the positive or negative ions in the salt water. The origin of using of concentrated salt water and ionic therapy for detoxification and healing can be traced back to ancient Ayurvedic medicine (the medicine of India). Foot baths detoxify based on those same principles. All you have to do is sit in a comfortable chair and relax for 20-30 minutes. The machine does the rest. You may see dramatic or more subtle changes in the color of the water, rest assured this is a normal (and beneficial) part of the detoxification process. Call 610-324-6185 or email us to schedule your Ionic Foot Bath today. A safe and ancient detoxification technique that gently loosens and pulls out excess wax, impurities, and congestion from deep within the ear canal. 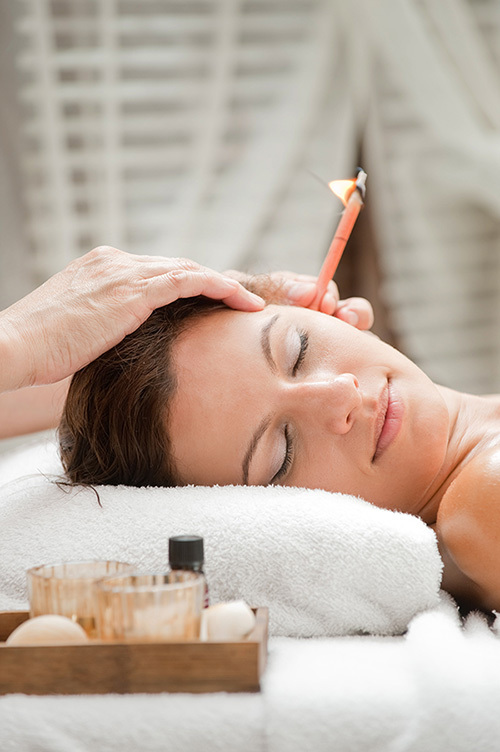 Professional ear candling calms pressure in and around the ear drum helping soothe a variety of symptoms. As you lie on your side, your practitioner will place an unlit hollow, cylindrical shaped candle in the opening of your ear. These candles are made from natural waxes and are designed with a safety filter to stop any debris from falling into the ear during the process. Once the candle is properly positioned you will be asked to lie still as it is lit on the opposite end from your ear. The lit candle creates a gentle suction that stimulates blood circulation encouraging the release of waste and toxins. You may hear crackling and suction, but you will experience no discomfort, pain, or heat sensation from the candle. This gentle service takes about 30 minutes, is safe for adults and older children (who can lie still) and is ideal for supporting normal immunity and lymphatic flow, relieving occasional change-of-season discomfort, and as part of specific detoxification programs. Call 610-324-6185 or email us today to schedule your Ear Candling appointment.